Do you need cover for your outdoor stage or a festival stage for your event? Then look no further because RJCC Events have got you covered! These are ideal for bands at small to medium sized events, fundraisers and University Balls. 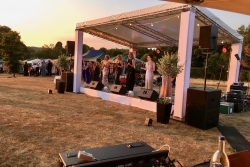 From small to medium size stage like the one pictured, to mobile trailer stages where speed of setting up and quick removal is required, to much larger festival stages for live events we cover the whole of Oxford and beyond. 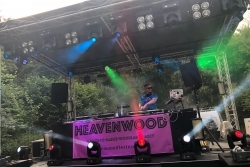 The truss stage pictured comes with a heavy duty 600gsm waterproof canopy in either black or white canvas to suit your event. Additional side scrims can be added as well as water ballast tanks to secure in windy conditions.